Celebrate Presidents’ Day with these Facts about President’s Teeth! If you went to elementary school in the United States, chances are you may have heard the funny stories about George Washington and his teeth. Stories about our first President’s teeth expound wild possibilities, ranging from claims that they were made of wood or even hippopotamus bone to myths that they were actually spring-powered! So what were George’s teeth really like? And for that matter, what about the teeth of all the other presidents? You never hear about them, but a lot of those guys had some odd dental situations. This President’s Day, join Penn Dental Medicine in celebrating the history of presidential smiles! George Washington only had one real tooth at his inauguration. The rest were spring-fit dentures filled with other people’s teeth! The dentures apparently creaked and clicked when he ate or spoke. Imagine trying to give the State of the Union in that condition! Abraham Lincoln was terrified of dentists for his whole life due to a tooth extraction gone horribly wrong early in his life–the accident cost him part of his jawbone! He was also one of the first people to use an anaesthetic at the dentist’s office. Next time you need a cavity drilled, make sure to thank Abe! John Quincy Adams, the 6th president, was diagnosed with smallpox and dosed with mercury, an extremely toxic substance that was commonly used as a remedy at the time. For the rest of his life, he had severe dental problems related to mercury poisoning and gum rot. The fact that he started smoking at age 8 probably didn’t help. Andrew Johnson was the first American president to be impeached by Congress. We hope that this had nothing do with the fact that he had such bad teeth that he drooled constantly while talking, and sometimes even with his mouth closed. Ulysses S. Grant, American president and Civil War general, usually only carried a toothbrush with him when he went to battle. Since he was directing the troops and inspiring the men, he thought it was more important to be armed with a pearly-white smile than a rifle. 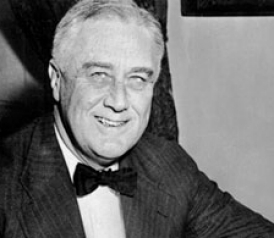 Franklin D. Roosevelt had braces as a child, but it is difficult to tell because most of the famous pictures of him show him with his mouth closed. If you happen to find one of him smiling, though, you can see how straight his smile is. The President doesn’t have to worry about scheduling an appointment with the dentist. The White House has its very own dental office tucked away in a sub-basement! This office is reserved for presidential use (not only the president, but a few important staffers, family, etc.) and has been there for decades! Woodrow Wilson suffered a stroke in the year 1919, and some dentists believe that his dental problems may have been an associated cause. Modern research has linked poor dental health to heart disease, stroke, and a few other dangerous health conditions. Dwight D. Eisenhower once had an emergency dentist’s office visit that sparked a conspiracy theory that claimed that the president met with alien life-forms at Edwards Air Force Base! The reason for the visit? Ike broke a crown while eating a chicken wing. Grover Cleveland developed a pretty serious tumor in his mouth right as the country was going into a recession. Not wanting to panic the public more, he scheduled a secret surgery and had the cancer removed on a yacht by a team of six doctors! You might not have Presidential teeth (and maybe that’s a good thing! ), but you can have a presidential smile at Penn Dental Medicine. Celebrate President’s Day with us by making an appointment to transform your smile!